The Basset Bleu de Gascogne is a medium French purebred also called the Blue Gascony Basset and the Bleus de Gascogne. 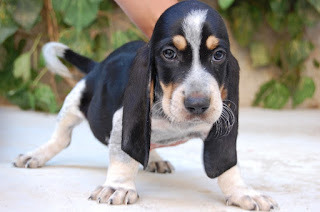 It is a hound and the Basset part of its name refers to it being short legged and long bodied. The bleu part of its name refers to the ticked appearance it has and Gascogne is the region of France it comes from. Descendent of the Grand Bleu de Gascogne it is an ancient breed and was bred to be a scent hound tracking larger prey like boar and wolf but also used as well as to track rabbits and hare. 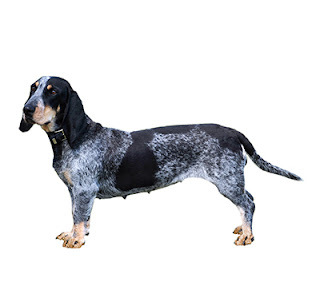 The Basset Bleu de Gascogne is one of the oldest breeds of French Basset and is descended from the large Grand Bleu de Gascogne and the Petit Bleu de Gascogne. It is not known whether the Basset Bleu de Gascogne is a natural mutation of the larger Bleu de Gascognes or whether the breed was created by crossing a larger Bleu de Gascogne with another breed of Basset, most likely the Saintongeois Basset. As the breed was created well-before the keeping of records of dog breeding, the true origin of the breed may never be known. What is known is that the breed originated in the Gascony region of France, and that the first appearance of what may be a Basset Bleu de Gascogne comes from paintings made in Gascony in the 1300’s. It is widely believed that Gaston III of Fox-Bearn, the writer of what is considered the classic treatise on medieval hunting, The Livre de Chasse, kept a pack of Basset Bleu de Gascognes. The Kennel Club of the UK recognizes the Basset Bleu De Gascogne in the imported breed register and in the Hound Group. The United Kennel Club recognised the breed in 1991, and both they and the Fédération Cynologique Internationale (FCI) list the Basset Bleu De Gascogne in the Scenthound Group. The breed is also known as the Blue Gascony Basset in the FCI. The Basset Bleu De Gascogne is not recognized by the American Kennel Club or the Canadian Kennel Club. In addition to the major registries, the Basset Bleu De Gascogne is also recognized by many minor registries and specialty registries, including as a rare breed under the American Rare Breed Association which uses the FCI standard. Basset Bleu de Gascognes tend to be lively, happy, active and affectionate dogs. When outside in a hunt they are very agile, focused, full of vigor and stamina. In the home it is more laid back, friendly and social and steady. It wants to be a part of family activities and it can be a loud dog, barking, howling and so on. Training will be needed to stop that on command and understanding neighbors or no close neighbors would be best! It has a very curious nature and will want to explore everything. It is a pack dog though and enjoys having other Bassets around it especially for times when you are out as it does not like to be left alone for long periods. This dog tends to be quite friendly with everyone even strangers so it is not the best option if you want a dog that can act as a watchdog. As mentioned in most cases they are an affectionate dog but there are some that a bit more reserved, but a well bred and raised one should never by shy or aggressive. It will be devoted to its owners but can suffer from separation anxiety so is best in a home where someone is there more often than not. It can be stubborn and independent sometimes but is fairly adaptable too. 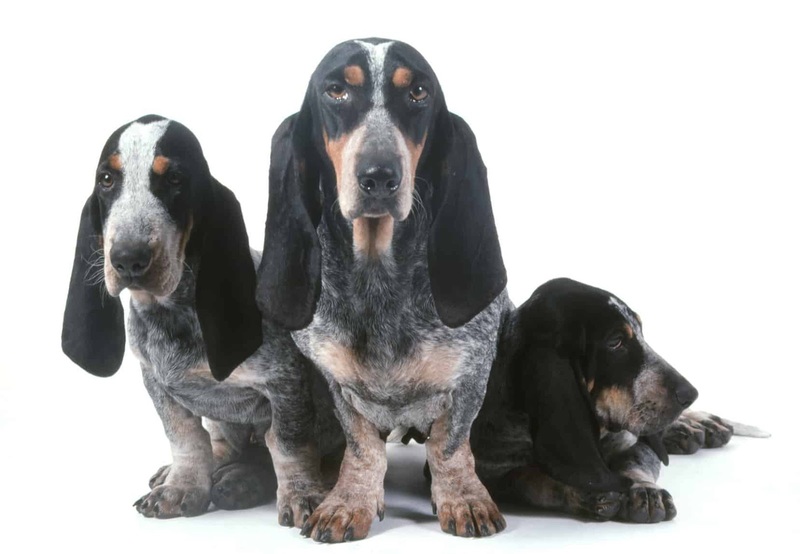 The Basset Bleu de Gascogne is generally a healthy and hardy breed not prone to any major inherited conditions. Like all dogs, however, this breed is prone to certain minor health problems which may include bloating, back problems, hip dysplasia, ear infections, and gastric torsion. 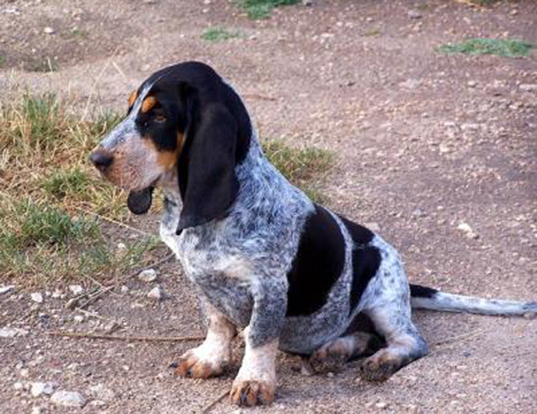 The Basset Bleu de Gascogne is an intelligent breed that excels in hunting so they are fairly easy to train. The best way to train this breed is to use positive reinforcement training methods and to maintain a firm and consistent hand in leadership. This breed does have a bit of an independent streak due to its hunting background, so be sure to maintain a position of authority in the home. This dog is not meant to be kept solely as a family pet, so be prepared to train your Basset Bleu de Gascogne for hunting or for other dog sports. Generally, they are happen when given a job to do, even if it is not hunting. As a hunting breed, the Basset Bleu de Gascogne has moderate needs for exercise. They generally do well with 30 minutes of moderate exercise daily and much of their exercise needs can be met with active playtime or tracking games. These dogs do not do well when left alone for long periods of time. Is the Basset Bleu de Gascogne the Right Breed for you? Difficult Training: The Basset Bleu de Gascogne isn't deal for a first time dog owner. Patience and perseverance are required to adequately train it.